Acidophilus helps prevent diarrhea in kittens. Acidophilus (Lactobacillus acidophilus) is a type of beneficial bacteria found in the small intestine of mammals, including both humans and felines. These friendly bacteria won't harm your kitty and actually have many health benefits for her. Acidophilus is commonly fed to growing kittens to help prevent digestive issues. Acidophilus, also referred to as lactic acid bacteria, is commonly found in fermented foods, including milk products like yogurt. Most yogurt contains other beneficial bacteria, such as Lactobacillus bulgaricus and Streptococcus thermophilus, along with acidophilus, according to the Dannon website. These beneficial bacteria, commonly known as probiotics, are available in gel and powdered supplements specially formulated for kittens. You can use both acidophilus-containing supplements and yogurt to help your furry friend maintain a healthy balance of flora in her digestive tract, according to the Pet Care Naturally website. Probiotics help to better digest food and absorb the nutrients it contains, encouraging healthy growth. Kittens are more prone to upset tummy issues than adult cats because they are going through all kinds of stressful situations as they mature. When the little ones are weaned, placed in new homes or even dewormed, they experience stress and sometimes tummy upset, according to pet products developer and manufacturer PetAg's website. Probiotic supplements that contain acidophilus can help with these issues by reducing gastrointestinal upset including diarrhea, vomiting and loss of appetite. These issues are particularly dangerous for kittens because they can lead to life-threatening dehydration and low blood sugar, the Clermont Animal Hospital website warns. Supplements containing acidophilus are also helpful for kittens who are receiving antibiotics to treat a medical condition, which can negatively alter their normal digestive flora. 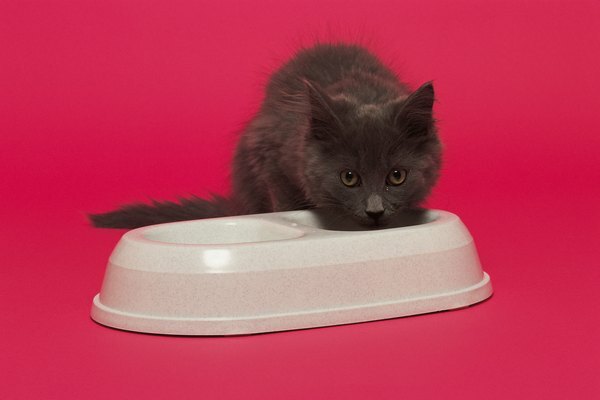 According to the American Journal of Veterinary Research, cats served a diet supplemented with acidophilus were found to have higher amounts of helpful Lactobacilis bacteria in their stool. They had a lower amount of potentially harmful bacteria like Clostridium species and Enterococcus faecalis in the feces, which can produce toxins in the body. In addition, the pH of their feces was changed to encourage only beneficial bacteria to flourish. The felines experienced an improvement in their immune system functions with the supplements. When it comes to kittens, this means that probiotic supplements and yogurt may not only help encourage a proper balance of flora in the digestive system but can also help with immune system development. Acidophilus and other probiotics can help orphaned kittens adjust to eating kitten formula instead of their mother's milk. Adding 1 to 2 tablespoons of yogurt to your kitty's formula can help alleviate or avoid diarrhea, recommends the New York City Feral Cat Initiative. You can also mix yogurt or probiotic supplements into your furry buddy's food when she's first weaning onto solids to prevent digestive issues from the change in her diet. Before giving any supplements to your kitten, including acidophilus, consult with your veterinarian. While probiotics may help kittens experiencing tummy issues due to stress or dietary changes, those with a medical illness causing the condition won't improve and need a proper diagnosis with your veterinarian. Can Cats Transmit the MRSA Infection? Do Adult Cats Have Strong Immune Systems to Fight Off Viruses? Can Kittens Get an Abscess From Being Neutered? What Is the Fastest Way to Cycle an Aquarium?